Éire Óg were left heartbroken at Cloughjordan on Wednesday evening when a heroic effort from the Blues fell agonizingly short against a terrific Roscrea team in the U14A north final. 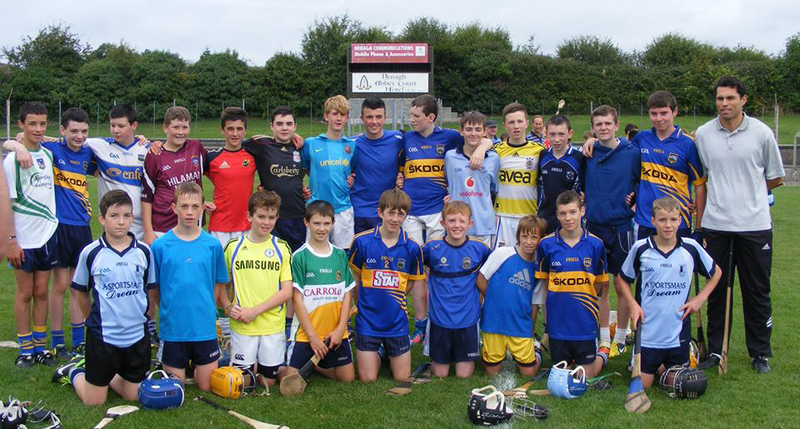 Heroes: the Nenagh Éire Óg under-14A hurling team. Éire Óg were left heartbroken at MacDonagh Park, Cloughjordan on Wednesday evening when a heroic effort from the Blues fell agonizingly short against a terrific Roscrea team in a hard-fought under-14A north Tipperary hurling final. Éire Óg arrived in Cloughjordan chasing a 12th under-14A divisional title, but were cast in the role of underdogs having lost (0-7 to 4-16) against Roscrea during the group phase of this year’s competition. The Blues, however, seized the initiative, worked tirelessly and only came undone when a late scoring surge from Roscrea denied the Blues a famous win. Indeed, the Éire Óg lads were a credit to themselves, their families and everyone associated with the preparation of this team. The Blues started in positive fashion with points from Killian Malone (free), Conor McCarthy and Barry Coffey helping Éire Óg into a 0-3 to 0-1 lead by the 11th minute. A fluke goal in the 12th minute handed Roscrea the lead while a pointed free left Éire Óg trailing 0-3 to 1-2 by the 13th minute. Conor McCarthy was misfortunate to see a goal chance fly narrowly wide in the 14th minute, but Éire Óg shook off that disappointment when Jake Morris landed a huge free from his own 65-yard line in the 15th minute. Then, seven minutes later, Jake Morris converted a ’65 to level it up (0-5 to 1-2). To their credit Roscrea closed out the opening half in positive fashion with two late points handing them a 1-4 to 0-5 interval advantage. Within four minutes of the second half Éire Óg were level thanks to a Killian Malone free and a terrific point from Barry Coffey – 0-7 to 1-4. Roscrea converted a free and a ’65 to scoot into a 1-6 to 0-7 lead with fifteen minutes to play. Five minutes later Éire Óg conjured a goal-scoring opportunity when Conor Bonnar won Evan Murphy’s long-range free; Bonnar fired in a rasping shot, but the Roscrea ‘keeper pulled off a great save. A Killian Malone point with six minutes to play narrowed the gap to a single point (0-8 to 1-6), but Roscrea responded with a point of their own before the Roscrea ‘keeper saved brilliantly once more, this time from the raiding Conor McCarthy. Sadly, Éire Óg, who were hurling into the wind, struggled thereafter and Roscrea closed out the game with three further points. The Nenagh Éire Óg under-14A team was managed by David Minogue, Michael Hallinan and Donie O’Brien – the club would like to thank the management team for their work this year. It is also worth noting that this group of players won the north Tipperary under-14A football title this year. Congratulations to Roscrea who bridged a nineteen-year gap on Wednesday evening – Roscrea last won the under-14A title in 1994. Nenagh Éire Óg: Scott O’Brien, Fiachra Starr, Evan Murphy, Ethan O’Brien, Conor Bonnar, Jake Morris (captain, 0-2, 0-1 free, 0-1 ‘65), Mark Carey, Peter Folen, Mark O’Farrell, Barry Coffey (0-2), Killian Malone (0-3, 0-2 frees), Daniel O’Donovan, Daniel Molamphy, Conor McCarthy (0-1), Seánie McTiernan. Subs: (3rd) Fiachra Carey for Daniel O’Donovan, (HT) Conor Hennessy for Mark Carey. Panel members: Aaron White, Shane Flynn, Seán Shanahan, Steve Hallinan, Cian O’Brien, Alan Manning, Luke Carroll, Dylan Carey, Conor Sullivan, Seán Phelan, Albert Purcell. Nenagh man, Shane Delaney, had an accident earlier this year in Australia and suffered damage to his spinal cord leaving him paralysed from the chest down. After having surgery in Australia Shane returned to Ireland near the end of June and has been working hard at his rehabilitation in Dun Laoghaire for the past few weeks. He is extremely positive and mentally strong and has been an inspiration to our whole community. Shane and his family have strong links to the Nenagh Éire Óg club with both himself and his brothers, David and Liam, representing the club at juvenile level and remaining strong supporters throughout. 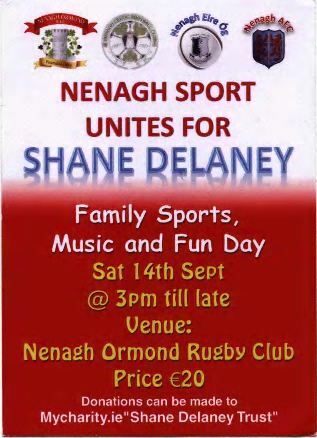 Nenagh Éire Óg have joined together with Nenagh Ormond RFC, Nenagh AFC and Nenagh Celtic to organise a huge fundraising event for Shane on Sunday, September 14th. Tickets for the event are priced at €20 each, are now on sale for this event and are available from club officers and committee members. Please support this very worthy event! Please support our under-14A hurlers who take on Roscrea in the north final on Wednesday, August 28th in MacDonagh Park, Cloughjordan (throw-in 6.30pm). Come on out and support the Blues! The Éire Óg under-14 hurlers who have qualified for the north final following a 3-9 to 2-9 win over a terrific Toomevara team on Thursday evening. Senior: Our senior hurlers recorded a comfortable win over Silvermines in round four of the championship on Saturday evening last. The Blues now progress to the quarter-final stage where we play one of the divisional winners – final score: 1-21 to 0-8. The quarter-final draw will take place in two weeks’ time with the quarter-finals scheduled to take place on the week-ending September 14th-15th. Éire Óg join divisional champions Kildangan (north), Éire Óg Annacarty-Donohill (west), Drom & Inch (mid) and Killenaule (south) in the last eight. Loughmore-Castleiney beat Roscrea (0-21 to 2-11) in the fourth round of the county championship on Saturday evening while there are two remaining games in round four (Borris-Ileigh v Carrick & Toomevara v Clonoulty-Rossmore). In the quarter-finals the divisional champions will be seeded. Junior A: Our junior A team completed the group stage of their championship on Friday evening last with a 2-19 to 3-9 victory over Moneygall. As a result Éire Óg topped their group and progress straight to the semi-finals. The semi-final opposition should be known later this week. On Friday Toomevara face Kildangan in one quarter-final while on Sunday Knockshegowna take on Kilruane MacDonagh’s. Minor A: Our minor hurlers have completed the group stage of their championship following last week’s win over Kildangan. The semi-final opposition should be known later this week – depending on result of the Roscrea-Kildangan game this week Éire Óg could face Borris-Ileigh, Newport Gaels or Kildangan at the semi-final stage. Toomevara finished second in the group and will play third-placed Roscrea in their respective semi-final. Hard Luck: We extend our commiserations to former Éire Óg stalwart John Flannery who was a member of the Shannon Rovers panel which lost the north Tipperary intermediate hurling final to Ballina on Sunday evening. Thanks: Unfortunately the Nenagh Éire Óg junior B team has been withdrawn from the championship. The club would like to thank manager Derek Lillis and all the players for their fantastic efforts this year. A group of Éire Óg hurlers pictured with Cork’s Seán Óg Ó hAilpín following a coaching session at MacDonagh Park, Nenagh. Under-14: Our under-14 team defeated Toomevara on Thursday evening last in the north semi-final – the final score was 3-9 to 2-9. Our boys now qualify for the north final against Roscrea. This game takes place on Wednesday, August 28th at 6.30pm in MacDonagh Park, Cloughjordan. Please come out and support the team. Also, best wishes to Jake Morris and Mark O’Farrell who travel to Waterford with the Tipperary under-14 team which will participate in the Tony Forristal tournament on Saturday, August 31st. The Nenagh Éire Óg under-14A hurlers who beat Toomevara on Thursday evening last: Scott O’Brien, Fiachra Starr, Evan Murphy, Ethan O’Brien, Conor Bonnar, Jake Morris, Mark Carey, Peter Folen, Mark O’Farrell, Barry Coffey, Killian Malone, Daniel O’Donovan, Daniel Molamphy, Conor McCarthy, Seánie McTiernan. Subs: Fiachra Carey for Carey, Shane Flynn for Molamphy. Under-8: The under-8 team welcomed Borris-Ileigh to Nenagh for a fun and entertaining challenge match on Saturday morning. A great time was had by all. Under-10: Our thanks to the Silvermines club for hosting an under-10 challenge match on Thursday last. There will be a slight change in training times this Wednesday to enable the boys to go to the under-14 north final. Training will be from 5pm to 6pm. Under-16: The re-scheduled Roscrea fixture will not now go ahead and Nenagh have been handed a walk-over. There is still the final league match against Kilruane to be played with no date set as yet. Recycling Drive: Please bring your unwanted clothing, bedding, curtains and shoes to the clubhouse on Saturday, August 31st from 10-4pm to take part in our Recycling Fundraising Drive. All proceeds go to the juvenile club and in turn back to the boys. Minor: The minor team defeated Kilruane MacDonagh’s 2-16 to 0-08 last Monday in the championship. They play Silvermines this Thursday at 7pm in Nenagh. Congratulations to Sinéad Meagher who is the new Munster under-13 singles champion. She beat Cork opponents in the 60 x 30 competition last Saturday. She now joins her sister, Eimear Meagher, who recently won the Munster under-14 singles 60 x 30 title. This is a great achievement for the club and these very talented girls. Hard luck to Aaron Hogan and Eoin Meagher who reached the Munster semi-finals of the under-17 doubles before losing out to Limerick opponents. We all wish the very best of luck to Munster representatives, Nenagh coach Eamon Spillane and partner Gerry Foley of Ballinahinch as they take on Monaghan and Ulster winners in the All-Ireland semi-final of the Emerald Masters competition in Cavan on Saturday. The August edition of the club newsletter is out this week. Check our Facebook page for the link to it or email eireognenagh@gmail.com for your copy. We are always looking for articles, photographs or other pieces of interest for the newsletter. If you have anything you would like to contribute please email eireognenagh@gmail.com. Nenagh Éire Óg progressed to the quarter-finals of the 2013 Clean Ireland Recycling County Senior Hurling Championship thanks to a sixteen-point win over north finalists Silvermines at Cloughjordan on Saturday. Nenagh Éire Óg progressed to the quarter-finals of the 2013 Clean Ireland Recycling County Senior Hurling Championship thanks to a sixteen-point win over Silvermines at Cloughjordan on Saturday evening. Éire Óg impressed in the opening half and led 1-14 to 0-1 at the break. Points from Kevin Tucker (three frees), Michael Heffernan (two), Tommy Heffernan (two) and Richie Flannery helped Éire Óg into a 0-8 to no-score lead inside the opening fourteen minutes. The ‘Mines got off the mark in the 15th minute before Paddy Murphy found the side netting following great work from Michael Heffernan. Further points from Kevin Tucker (four frees & one point) and Brian Quinn forced Éire Óg into a thirteen-point lead before Richie Flannery broke Barry Heffernan’s long-range free down to Michael Heffernan and the Blues’ centre-forward rattled the net to hand Nenagh a 1-14 to 0-1 interval advantage. Éire Óg’s performance immediately after the break was a little sluggish. Indeed, the ‘Mines scored four points without reply before the Blues hit back thanks to a Michael Heffernan free in the 42nd minute – 1-15 to 0-4. A minute later Michael Heffernan converted a’65 before a Barry Heffernan point from play left sixteen points between the teams (1-17 to 0-4) entering the final quarter. Jason Forde converted a ’65 on behalf of Silvermines, but Tommy Heffernan responded for Éire Óg before Orrie Quirke landed his side’s sixth point in the 49th minute. Éire Óg substitute Donnacha Quinn landed a fine point with eight minutes to play before Tommy Heffernan notched his fourth point from play. A Jason Forde free reduced the deficit to sixteen points once more in the 57th minute and while Johnny Slattery brought the scoring to a close from an Éire Óg point of view in the 58th minute the ‘Mines had the final say in the matter. Éire Óg now join divisional champions Kildangan (north), Éire Óg Annacarty-Donohill (west), Drom & Inch (mid) and Killenaule (south) in the last eight. Loughmore-Castleiney beat Roscrea (0-21 to 2-11) in the fourth round of the county championship on Saturday evening while there are two remaining games in round four (Borris-Ileigh v Carrick & Toomevara v Clonoulty-Rossmore). In the quarter-finals the divisional champions will be seeded. Nenagh Éire Óg: Michael McNamara, Mark Flannery, Noel Maloney, John Brennan, Daire Quinn, Hugh Maloney, Billy Heffernan (0-1), Barry Heffernan, Kevin Tucker (0-8, 0-7 frees), Paddy Murphy, Michael Heffernan (1-4, 0-1 frees, 0-1 ‘65), Pearse Morris, Brian Quinn (0-1), Richie Flannery (0-1), Tommy Heffernan (0-4). Subs: (51st) Donnacha Quinn (0-1) for Hugh Maloney, (53rd) Johnny Slattery (0-1) for Brian Quinn, (56th) Adam Grattan for John Brennan, (56th) Seánie Geaney for Paddy Murphy, (58th) Andrew Coffey for Pearse Morris. On Saturday evening next, August 24th the Nenagh Éire Óg senior hurlers will take on Silvermines in round four of the Clean Ireland Recycling Tipperary Senior Hurling Championship. Support appreciated. Senior: Nenagh Éire Óg have been drawn against Silvermines in round four of the Clean Ireland Recycling Tipperary Senior Hurling Championship. This crucial clash will take place on Saturday, August 24th at 6pm in MacDonagh Park, Cloughjordan. Three other games will take place in round of the 2013 county senior hurling championship: Roscrea v Loughmore-Castleiney (August 24th), Borris-Ileigh v Carrick Swan (September 7th) & Toomevara v Clonoulty-Rossmore (September 7th). The round four winners progress to the quarter-finals where they will be paired against the divisional champions – Kildangan, Drom & Inch, Killenaule and Éire Óg Annacarty-Donohill. The lads would really appreciate your support on Saturday evening in Cloughjordan. The replayed final of the Dr Fogarty Cup (County Senior Hurling Challenge Cup) will now take place against Burgess on Sunday, September 1st in Toomevara at 12 noon. Junior A: On Tuesday evening last our junior A hurlers continued their championship campaign when they defeated Toomevara in Moneygall on a scoreline of 1-21 to 0-21. This win guarantees the lads a semi-final place. Moneygall will provide the opposition in the final group game. This game takes place on Friday, August 23rd in Dolla at 6.30pm. Minor A: Our minors play Kildangan in their final group game on Tuesday evening last. Under-6 & Under-8: Training continues for the under-6 and under-8 boys on Wednesdays at 5.15pm and Saturdays at 10am. Under-10: The under-10 players are in the middle of a series of practise matches so full attendance is required at training please. Under-12: Hard luck to the under-12 group one hurlers who were very unlucky to lose out after extra time in their county semi-final against Knockavilla Kickhams on Saturday last. Éire Óg won the toss and elected to play with the aid of a strong wind in the first half and were quickly off the mark with a Conor Hennessy goal followed by a neat point from Brendan Long. Kickhams then scored a goal against the run of play, but the Blues responded well with three unanswered points from Conor Hennessy & Barry Coffey (2). As half-time approached a Seán Phelan sideline cut went straight to the Kickhams net to leave the lads leading 2-5 to 1-0 at the break. With the strong wind at their backs the winners responded early in the second half with an early goal and a string of unanswered points before Seán Phelan pointed Éire Óg’s only second half score from an acute angle. Kickhams levelled the game on the stroke of full-time. Neither side scored in the first five-minute period of extra time, but despite a courageous effort from the Blues the men from the west snatched the game with two late points. Final score: Knockavilla Kickhams 2-8 Éire Óg 2-6. Although the lads were bitterly disappointed at the final whistle it has been a great year. Team: Eoghan Tinkler, Liam Heffernan, Rory O’Donovan, Jamie Cottrell, Gavin Dooley, Barry Coffey, Brendan Long, Sean Phelan, Conor Hennessy, Cian Griffin, Conor Malone, Josh Keller and Dylan Murphy. Under-14: Our under-14 hurlers came through a tough test last Wednesday in Puckane to beat Kildangan 2-9 to 2-7 in the north Tipperary quarter-finals. The goals came from Conor McCarthy and Barry Coffey. The lads now face Toomevara in the semi-final on Thursday, August 22nd in Toome at 6.45pm. Please come out and support the boys. Friday, August 23rd in MacDonagh Park, Nenagh at 6.45pm. The postponed Roscrea game will now probably be played on Monday, August 26th in Roscrea but this fixture is subject to change. Congratulations: Well done to under-14 hurler Steven Hallinan who competed in the mini-7s at Croke Park during Sunday’s All-Ireland Semi-final. Under-13: Our under-13 team beat Silvermines by one point last week. Well done girls. Under-16: Our under-16 team put up a fantastic display in the county semi-final on Sunday last, but were beaten by Cahir by one point. This is the first time we have competed at under-16 level in the A grade so to get this far at the first time of asking is a fantastic achievement. Thanks to all the players and mentors for their efforts this year. Under-18: our under-18 team play Kilruane on Monday evening. Community Games: Thanks to the Community Games for their generous contribution to our expenses this year. It is very much appreciated. Leaving Cert: Congratulations to all our players and supporters who received results last week. We were amazed to discover we had so many genius’s in the club! On Saturday evening next, August 17th the Nenagh Éire Óg senior hurlers will take on Burgess in the replayed final of the Dr Fogarty Cup (County Senior Hurling Challenge Cup). Senior: On Saturday evening next, August 17th the Nenagh Éire Óg senior hurlers will take on Burgess in the replayed final of the Dr Fogarty Cup (County Senior Hurling Challenge Cup) in St Michael’s Park, Toomevara at 4.30pm. All support appreciated. Junior A: On Tuesday evening our junior A hurlers continue their championship campaign when they play Toomevara in Moneygall at 7pm. The junior A team will return to action for their final group game on Friday, August 23rd when the lads face Moneygall in Dolla at 6.30pm. Junior B: The Blues’ junior B hurlers are in championship action on Sunday, August 18th at 12 noon when they face Newport in Dolla. Minor: The minor A hurlers conclude the group stage of this year’s championship when the lads host Kildangan at MacDonagh Park, Nenagh on Tuesday, August 20th at 6.30pm. Fantasy Football: Nenagh Éire Óg are running a Fantasy Football League. No prizes for the winner, but bragging rights are priceless. Register to play click here and use the following code to access the Nenagh Éire Óg Fantasy Football League: 425641-107883. Club Newsletter: The July edition of the Nenagh Éire Óg newsletter is also available and well worth a look: just click! Lotto: There was no jackpot winner this week. The 5 x €50 lucky dip winners were: Linda Ryan (Benedine), Mick Burns (Monaree), Kathleen Devaney (c/o Jane), Pat Maher (c/o Eamon Spillane) & Recce Mulrooney (Cloughjordan). Under-10: The boys began a series of challenge matches on Monday last with games away to Ballina. Our thanks to Ballina for hosting the evening. Under-12: The under-12 group one hurlers were crowned north champions after a comprehensive victory over Borrisokane on Saturday last. Éire Óg played against the breeze in the first half and led 1-2 to no score at half-time with the goal coming from midfielder Brendan Long. The Blues dominated the second half and added three further goals from the sticks of Barry Coffey, Dylan Murphy & Josh Keller. The lads have now qualified for the county semi-final due to be played on Saturday next. The group four hurlers unfortunately lost out to Templederry in their group four final on a scoreline of 3-4 to 1-3. The winners led by 2-3 to 0-2 at the interval. A second half Paul McLoughlin goal gave Éire Óg hope, but despite a brave fight back from the Blues Templederry finished strongest and we wish them the best of luck in the county series. Well done to the North Tipperary Juvenile Board and the Borris-Ileigh club on their excellent hosting of the finals. Thanks also to our supporters and the juvenile club who provided hot food for both teams on their return to the complex. Under-14: Our under-14A hurlers play Kildangan this week in the North Tipperary quarter-finals. The game takes place on Thursday, August 15th in Puckane at 6.45pm. Please come out to support the boys. Under-16: Congratulations to our under-16A hurlers who maintained their winning run when beating Borrisokane 1-24 to 2-9 on Monday evening. The Blues’ next game is a home match against Kilruane MacDonagh’s on Monday, August 19th at 6.45pm. Under-10: Our under-10 team are heading to Dundrum this Saturday to take part in the annual Moira Cahill Blitz. Best of luck girls, have a great day out and thanks to Knockavilla for the invite. Under-12: The under-12 league will commence in a few weeks and mentors will be in touch shortly. Under-13: The under-13 team drew with Éire Óg Annacarty on a scoreline of 0-9 each last week. They play Silvermines in Dolla on Tuesday. Under-14: The under-14 league will commence in a few weeks and mentors will be in touch shortly. Under-16: The under-16 championship semi-final is this Saturday in The Ragg at 2.30pm against Cahir. We hope a big crowd from the club come to support the girls who have been training extremely hard all year for this. Under-18: Our minors play Moneygall on Tuesday in the championship and play Kilruane MacDonagh’s next Tuesday in Nenagh. Junior: the juniors are playing Ballingarry on Sunday, August 25th at 12 noon in Nenagh in the opening round of the championship. They face Moneygall the following Saturday 7th September in Nenagh. Congratulations to Nenagh Éire Óg under-16 Camogie stars Rachel Maher, Rachel Spillane, Grace O’Brien and Saoirse Gleeson who won an All-Ireland title with Tipperary on Saturday afternoon last in Portlaoise. 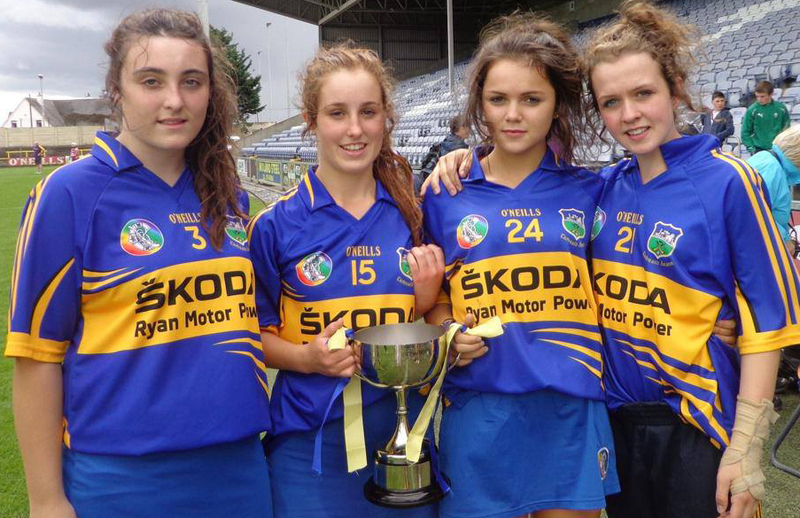 Our latest All-Ireland Champions – Rachel Maher, Grace O’Brien, Saoirse Gleeson & Rachel Spillane. Junior A: Our junior A team will look to maintain their one hundred per cent winning start to the championship on Friday evening when they play Toomevara in Moneygall at 7.30pm. Minor A: Our minor hurlers were scheduled to play Kilruane MacDonagh’s on Tuesday evening, but that game was called off since Kilruane gave the Blues a walkover. Best Wishes: Best wishes to Tommy Heffernan, Daire Quinn and the Tipperary under-21 team in Wednesday evening’s Munster final against Clare in Semple Stadium, Thurles (throw-in 7.30pm). Commiserations: Hard luck to Paul O’Leary who was a member of the Tipperary minor football panel which lost to Monaghan in an All-Ireland quarter-final played in Longford on Monday afternoon. County Championship Guide: In round three Nenagh Éire Óg beat Upperchurch-Drombane while Roscrea beat Moycarkey-Borris 1-12 to 1-11. Those results leave two remaining games in round three: Borris-Ileigh face Burgess on August 10th while Templederry Kenyons take on Toomevara on August 17th. Following those games four teams in all progress to round four where these teams will play the losing divisional finalists. Thus far we know that Silvermines (north finalists) and Carrick Swans (south finalists) will feature in round four. Two divisional finals remain to be played: Loughmore-Castleiney v Drom & Inch (mid final fixed for August 11th), Clonoulty-Rossmore v Éire Óg Annacarty-Donohill (west final fixed for August 11th). Therefore Nenagh Éire Óg could meet Silvermines, Carrick Swans, the loser of the Loughmore-Castleiney v Drom & Inch clash or the loser of the west final between Clonoulty-Rossmore and Éire Óg Annacarty-Donohill in the fourth round. The winners of the fourth round games progress to the county quarter-finals – north champions Kildangan and south champions Killenaule are already assured of their place in the last eight. Éire Óg’s fourth round game could potentially take place on the week-ending of August 24th. Dr Harty Cup: For those interested the draw for the group stages of the 2013-14 Dr Harty Cup (Munster Colleges A Hurling) has been made. Group 1 – Thurles CBS, Castletroy College, Doon CBS & North Monastery. Group 2 – Blackwater Community School, Dungarvan CBS, Midleton CBS, Nenagh CBS & Rochestown. Group 3 – Árdscoil Rís, Hamilton High School, St Flannan’s, De La Salle & St Colman’s College. Group 4 – Our Lady’s Templemore, Charleville CBS, Clonmel & Youghal. Fantasy Football: Nenagh Éire Óg are running a Fantasy Football League. No prizes for the winner, but bragging rights are priceless. Register to play here and use the following code to access the Nenagh Éire Óg Fantasy Football League: 425641-107883. Club Newsletter: The July edition of the Nenagh Éire Óg newsletter is also available and is well worth a look: just click! Under-12: The under-12 group one hurlers qualified for the north final on Wednesday last following a hard-fought victory over Roscrea. In an excellent game of hurling Éire Óg came through by the narrowest of margins on a scoreline of 0-11 to 1-7. The group one team have now joined the group four team in the finals – both finals take place in Borrisoleigh on Saturday next, August 10th with the group four game against Templederry Kenyons at 11.30am and the group one final versus the winners of Borrisokane and Kildangan at 1.30pm. Please come out and support both teams on the day! Under-14: The north Tipperary under-14A hurling quarter-final against Kildangan scheduled for August 8th will now take place a week later on Wednesday, August 15th in Puckane. Under-16: Well done to the Nenagh Éire Óg under-16A hurlers who beat an excellent Toomevara on Monday evening at MacDonagh Park, Nenagh on a 3-8 to 1-10 scoreline. The under-16A championship continues with an away match against Borrisokane on Monday, August 15th at 6.45pm. Nenagh Éire Óg – under-12 north Tipperary group one finalists. Junior B: Our junior team were scheduled to play Ballina on Monday last, but the game was postponed and will be re-fixed for a later date. Congratulations: Congratulations to the Tipperary under-16 Camogie team which won the All-Ireland final on Saturday last when the Premier defeated Galway in Portlaoise. Éire Óg had four girls on the panel – Saoirse Gleeson, Rachel Maher, Racher Spillane and Grace O’Brien. This is a fantastic achievement and we send our congratulations to all involved. Minors: Playing next Tuesday against Clonoulty-Rossmore. Bag Packing: Last Friday and Saturday in Tesco we had our bag packing fundraiser. Thanks to the players and parents that helped out. 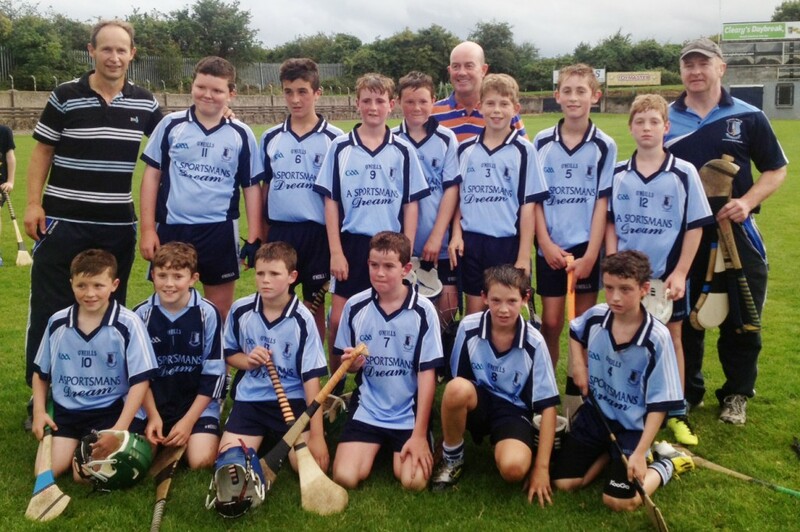 Under-13: The under-13s beat Silvermines last week in the championship.